Northwestern Engineering partners with the Block Museum to inspire a new generation of independent thinkers. Northwestern University scientists and students are working to unravel some of her mysteries, including how her body was prepared 1,900 years ago in Egypt, what items she may have been buried with, the quality of her bones and what material is present in her brain cavity. Nearly 2,000 years ago in the Fayum region of Egypt—an agriculturally rich area west of the Nile Valley—a relatively healthy five-year-old girl died, likely of a bacterial or viral infection. Though such deaths were common, her well-off family mourned her in what was then the traditional local custom: mummification. Her organs were removed, but her heart was kept in place. She was embalmed, wrapped in 10 square meters of expensive linen, and given a final parting gift: a portrait painted on a wooden panel and fitted within ornate wrappings around her head. She was then placed in a tomb, where she lay until 1910. Her journey from there has taken many twists and turns—from London to Chicago, from a seminary to a hospital and a high-energy X-ray facility—that her mourning family could never have imagined so long ago. But one mystery has always remained unsolved: Who was this girl? Over the past year, Northwestern students, faculty, and researchers from art, engineering, classics, and medicine have all come together to examine her journey, propose theories, conduct research, and ultimately to exhibit their work, all in the quest of solving the mystery. 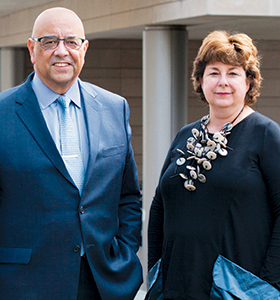 That question—posed by Lisa Graziose Corrin, the Ellen Philips Katz Director of Northwestern’s Mary and Leigh Block Museum of Art—is perhaps the question, meant to jolt young students out of complacency and into a world of risk and uncertainty. After all, life is not about the outcome, it’s about the process, the journey. That frame of mind, essential to artists, must sometimes be taught to young engineers who can too easily approach a problem as though they could find the answer in the back of the book. It’s also the frame of mind that forms the basis for whole-brain engineering, Northwestern Engineering Dean Julio M. Ottino’s framework for teaching students to combine both analysis and creativity to solve problems that are known and to imagine future possibilities. Lisa Corrin was unfamiliar with whole-brain engineering when she arrived at Northwestern in 2012. At the time, the Block Museum was shifting its mission to focus more on interdisciplinary teaching and learning based on the idea that art is not just objects hung on walls. One of the first people to connect with her was Ottino. Their shared interdisciplinary mindset proved catalytic. “He immediately threw down the gauntlet when he said, ‘How should we work together?’” she recalls. Ottino, a painter himself, was eager to find connections to art for engineering students and faculty. Northwestern Engineering already had several connections with the art world. It’s the home of the Northwestern University/Art Institute of Chicago Center for Scientific Studies in the Arts (NU-ACCESS), which conducts scientific research in conservation and artistic provenance and process. The school also partners in teaching with the Department of Art Theory and Practice in the Weinberg College of Arts and Sciences, and with the School of the Art Institute of Chicago to bring engineering and art students together in the Data as Art course, which challenges groups of students to create art out of datasets. A partnership with the Block, however, held the potential to add yet another dimension. As Ottino and Corrin brainstormed possible ideas, one thing was clear: they wanted the focus to be not on a project or an outcome, but on the process itself. To that end, they worked with Susy Bielak, Susan and Stephen Wilson Associate Director of Engagement and curator of public practice at the Block, and Kyle Delaney, executive director of strategic initiatives and marketing at Northwestern Engineering, to invite a carefully selected group of artists—whole-brain thinkers whose work and ideas lie at the intersection of art and science—to deliver a series of lectures and to meet with faculty. “We wanted to see how these artists intersected with our faculty, where potential collaborations might lie, or how they might inspire each other’s thinking,” Ottino says. While the team sought out artists for the lecture series, Essi Rönkkö, Block Museum assistant curator, literally and figuratively found herself asking her own set of questions about how a life is lived. In this case, the questions centered on a specific life that had ended quickly almost 2,000 years ago. While preparing for an exhibit at the Block, Rönkkö became an accidental archaeologist: she discovered a mummy. It wasn’t exactly a discovery. 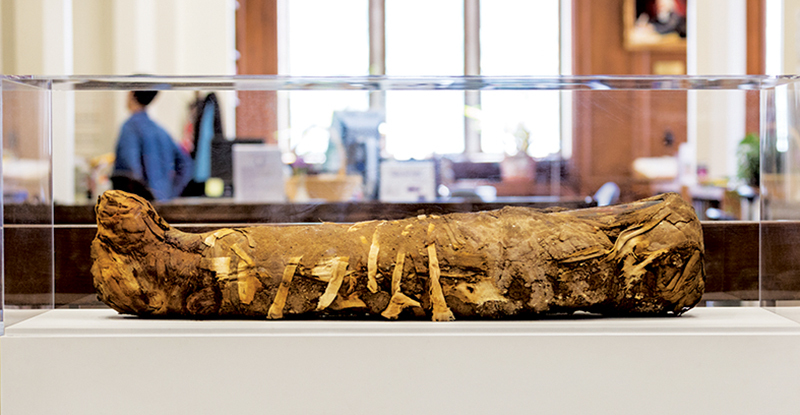 The mummy had lain in plain sight in the Garrett-Evangelical Theological Seminary on Northwestern’s campus for several years. After its excavation in 1910, the mummy had been displayed in London, then gifted to Lydia Beekman Hibbard of Chicago in recognition of her support of the original excavations. Hibbard in turn gifted it to the Western Theological Seminary in 1912. In 2009, the collections that once belonged to Western were acquired by Garrett-Evangelical, who placed the mummy on display. Rönkkö’s find proved purely serendipitous. She was working with Center co-director Marc Walton to mount an exhibit of mummy portraits from first-century Egypt. Walton, research professor of materials science and engineering, had previously analyzed Roman-Egyptian mummy portraits from the era using advanced imaging techniques to better understand how they were created. These portraits, housed in the Phoebe A. Hearst Museum of Anthropology at the University of California, Berkeley, had immeasurable historic and artistic value. They represented a shift in artistic thinking: after Egypt became part of the Roman Empire in 30 BCE, Greco-Roman-style, naturalistic two-dimensional portraits on wooden panels were introduced into Egyptian funerary practice. The mummy portraits, painted between 100 and 300 CE, now stand as some of the oldest known portraits in existence; all told, only about 100 mummy portraits remain attached to their wrappings today. When Rönkkö saw the mummy and noticed it had a portrait intact, she knew that she had found a new dimension for the exhibit. “Having a complete mummy to study transformed our project,” she says. “Our first phone call was to conservator Rachel Sabino from the Art Institute of Chicago to determine next steps.” Together, they decided to give the mummy a CT scan. The mummy was carefully transported to Northwestern Memorial Hospital and gently glided into a CT machine for the noninvasive procedure. 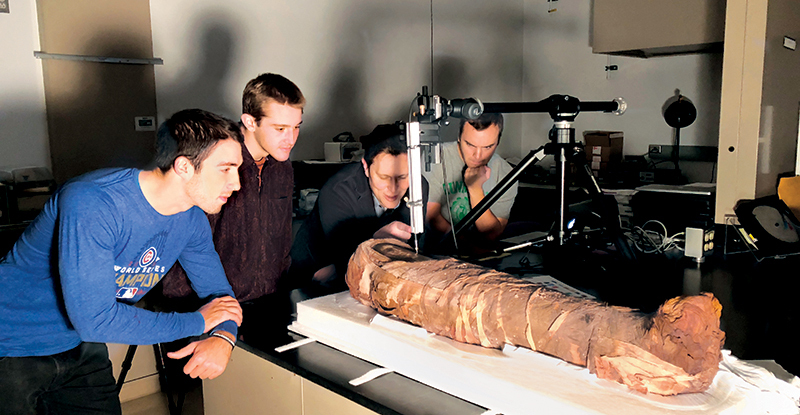 When mummies were excavated in the 19th century, they were often unrolled at elaborate “unwrapping parties.” But modern scanning technology renders unwrapping unnecessary; researchers can peek inside without destroying history. According to the mummy’s records, an X-ray image of it had been recorded more than 50 years ago to determine that there was a child inside. Rönkkö and the research team had looked at the image, noted a dense object on the abdomen and pins in the wrappings, and wanted to see what else they could find. Stuart Stock (’77, MS ’78), research professor of cell and molecular biology at the Feinberg School of Medicine and a Northwestern Engineering alumnus, led the scan. The results confirmed that the child was five years old when she died, give or take nine months. The portrait depicts a female, but a skeleton cannot confirm gender since skeletal differences emerge in puberty. The mummy’s soft tissue is well preserved, though, and the absence of male external genitalia indicates that the child was a girl, according to the team’s forensic anthropologist, Michala Stock (WCAS ’10). The child’s organs except the heart had been removed, and her nasal cavity had been perforated in order to remove the brain. Resin, which was poured into the cranium to help preserve the body, had pooled in the base of the skull. As happens in most research, the results didn’t answer every question: What was that dense sphere above her abdomen? What were the wires around her head and feet? The search for more answers continued when the mummy took yet another trip, this time to Argonne National Laboratory, for the first-ever scan of a mummy there. 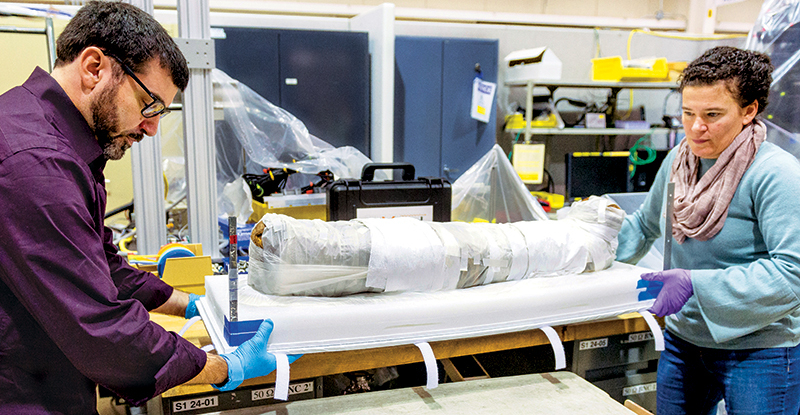 Researchers used the extremely brilliant high-energy synchrotron X-rays produced by Argonne’s Advanced Photon Source to probe the materials and objects inside the mummy. Stuart Stock and his team shone the pencil-shaped X-ray beam (about twice the diameter of a human hair) on the areas of high-density in the mummy that had been identified in the CT scan. They then used the X-ray diffraction patterns as “fingerprints” to identify the crystalline materials. That circular-shaped object above her abdomen? It consisted of high purity calcite, a major constituent of a material known as alabaster or travertine in historical documents. The material is soft and easily carved, raising speculation that the object could be a carved scarab amulet, a common burial accompaniment. Those wires around her head and feet? Turns out they are modern dual phase steel, similar to the material used in specimen pins in entomology. They were added later, likely to keep the wrappings in place. Stock is still analyzing the mummy’s tooth enamel and cortical bones. “From a medical research perspective, I am interested in what we can learn about her bone tissue,” he says. To further study the mummy, Walton led a course, which included engineering and humanities students, during fall semester 2017. Co-taught by Taco Terpstra, assistant professor of classics and history at Northwestern, the course challenged students to use research techniques in materials science, archaeology, and museum studies to understand how these ancient materials were created and used. Students used a technique called X-ray fluorescence to determine the distribution of iron, lead, and copper in the girl’s mummy portrait, which suggested significant use of ochres, Egyptian blues, and lead white paint. They also used computational imaging to determine that the paint was textured and thick, typical of encaustic painting (pigment mixed with beeswax) associated with mummy portraits from the Fayum region. The team’s findings were on display at the Block’s exhibit, “Paint the Eyes Softer: Mummy Portraits from Roman Egypt,” which ran through April 2018. Jen Bervin, an artist and poet whose research-driven works weave together art, writing, and science, was inspired by a meeting with professor Huang and by his work on stretchable, flexible electronics. Bervin had previously worked with bioengineers to create a nanoscale poem in the form of a silk biosensor. When she returned to Northwestern in winter 2018 as the Kaplan Artist in Residence, she taught a studio course in advanced materials that looked to Huang’s work and that of other faculty working across fields from materials science to nanotechnology as inspiration for researching materials as a source of content and form. Dario Robleto, a visiting artist whose work ranges from sculptures to soundscapes, returned in May 2018 for a month-long residency as an artist-at-large. His work often straddles the boundaries of art and science; he previously worked with a sound archaeologist to find a way to turn 19th century heartbeat tracings into playable sounds. “Dario has tremendous experience working collaboratively with members of a scientific community. The very nature of what he does—his practice is rooted in research—demonstrates his interest in interdisciplinary thinking,” Corrin says. Ottino says faculty members were impressed with Robleto’s work and his interest in being involved in the research process. As part of his residency, Robleto planned to meet with synthetic biology faculty members to discuss ethics and to work with computer science faculty members and the Segal Design Institute to help students move from a web of inspiration to a concrete idea. “The hope was that by giving Dario a ‘hall pass,’ by giving him access to the incredible brain trust of McCormick, and by putting him in direct contact with people whose work could be catalytic for him, we would enable relationships to evolve and connections to happen organically,” Bielak says. After the close of the exhibit, the mummy returned to the library, freshly cleaned with a new case and newly installed climate control measures to “keep her in a more stable environment,” Rönkkö says. Though the girl’s story was partially illuminated, faculty and researchers can only imagine what future technology might reveal. That sort of speculation fuels the future of the art/engineering partnership. Both sides plan to regroup after Robleto’s residency to see what worked, what didn’t, and what they might plan for the future. 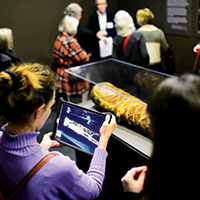 Visitors to the exhibit had an opportunity to see the internal structure of the mummy using a hands-on digital window. This interactive visualization was developed by electrical engineering and computer science senior Kyle Engelmann, mentored by Professor Oliver Cossairt and PhD candidate Nathan Matsuda. Engelmann converted the segmented CT data to a polygon surface representation suitable for real-time display, then developed a rendering model emulating X-ray images, which, when combined with Apple’s visual and inertial odometry tools, gave visitors a unique perspective. At a high level, scientists and artists connect through the need to make things—to enjoy the process of creation for its own sake. 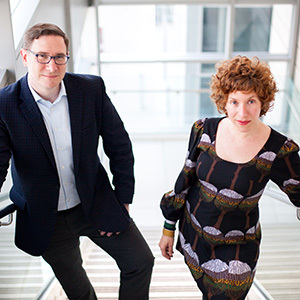 Julio M. Ottino and Lisa Corrin provide a few tips for those looking to expand their creative and analytical thinking. The best ideas come when artists and engineers leave their comfort zones and venture into unknown territory, whether it’s assembling a complex process, designing for a new client, or playing with a new material. “Uncertainty shouldn’t be frightening but exhilarating and energizing,” Corrin says. One person might simply enjoy the image of milk gently mixing into coffee, but a physicist might look at the same image and extract the seeds of understanding how regions can remain unmixed in oceans. “This is the essence of science: finding the simple picture that contains all pictures,” says Ottino, who had this thought himself. Artists do the opposite. “Artists take something cliché and turn it inside out and upside down to get us to see the world anew,” Corrin says. To find the best ideas, do both. There’s no prize for correctly solving the wrong question, Ottino says. For engineers, getting to a solution means finding the real problem, often obscured by the perceived problem. It also requires the constraint of operating within physical realities. Artists approach “problems” from a point of nonconformity. As unconventional thinkers unconstrained by the need for specific, tangible outcomes, they don’t fear being different, a trait that helps them push the boundaries of what’s possible. In fall 2017, professor Marc Walton (second from right) led a course that challenged engineering and humanities students to use research techniques in materials science, archaeology, and museum studies to examine Egyptian mummy portraits. Co-taught by Taco Terpstra, assistant professor of classics and history at Northwestern, the course taught students to use non-destructive imaging and computational imaging techniques to determine the types of paint used in the portraits. The team’s findings were on displayat the Block Museum’s exhibit, “Paint the Eyes Softer: Mummy Portraits from Roman Egypt,” which ran through April 2018.